Jetstar has taken delivery of the first 787 for an Australian airline with the handover of 787-8 VH-VKA at Boeing’s Everett plant on Monday. The long-awaited delivery is the first of 14 firm 787-8 orders held by the Qantas Group, which also has options and purchase rights on a further 50 787-8s and -9s for delivery from 2016. 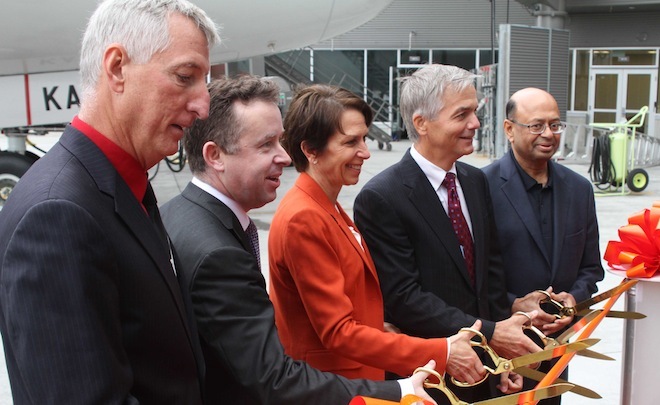 “Today is a historic milestone for the Qantas Group and Jetstar as we welcome the most advanced passenger aircraft ever constructed to the fleet,” Qantas Group CEO Alan Joyce, in at Everett for the delivery ceremony, said. After the handover ceremony VH-VKA departed Everett on its delivery flight to Melbourne, where it is due to arrive early afternoon on Wednesday after a stopover en route in Honolulu. Jetstar will use the 787-8s to replace its A330-200s on long-haul international routes (with the A330-200s being transferred to Qantas allowing Qantas in turn to retire its last 767-300ERs). Jetstar has yet to announce the first international route it will deploy the 787 on, but has said the 787 will enter limited domestic service between Melbourne and the Gold Coast beginning November 13, part of its program of building up crew and maintenance support experience in operating the aircraft before deploying it on international services before the end of the year. “We will introduce the 787 on services from Melbourne to the Gold Coast and Melbourne to Cairns for just over four weeks before we launch international services towards the end of the year,” Hrdlicka said. The Jetstar General Electric’s GEnx-powered 787 seats no fewer than 335 passengers in a two-class (21 business + 314 economy class) cabin. The Jetstar 787s are powered by . VH-VKA’s handover marks the end of a prolonged gestation for the aircraft’s entry into service with the Qantas Group, as Qantas first announced an original order for 65 787s back in December 2005. In June 2009 Qantas announced it was cancelling orders for 15 787-9s, and then in August 2012 announced it was cancelling another 35 firm 787-9 orders. Finally a single 787-8 order was cancelled in January 2013. And the 787 has been under the microscope since an overheating battery issues grounded the fleet earlier this year. But Boeing VP of the 787 program Larry Loftis told Australian Aviation that the 787 was almost as reliable as the industry benchmark the 777. “Reliability is within 1.5 per cent of the 777, “ said Loftis. Joyce added that the Qantas Group had thoroughly investigated the reliability of the 787 and was complete satisfied. The delivery of the 787 continues an aggressive fleet renewal for the Qantas Group with 160 new aircraft over the past four years. “We now have the youngest fleet we have ever had,” said Joyce. Anyone know what time (HNL time) when it’s due to depart HNL? Expected to depart HNL at 5.30 am Tuesday, Honolulu time. @Greg Hyde Thanks for that. It’s really good to see the Qantas Group fleet advancing and getting younger and younger. The 787’s will be excellent for Jetstar because of capacity and less cost involved, and they can also expand their international network. Who knows, they might even fly to Europe and mainland America. Great photo and good to see new aircraft type coming to Australia. I still think its a crying shame the aircraft is wearing Jetstar’s colours and not Qantas colours. Another good point is its a Boeing product for a change. 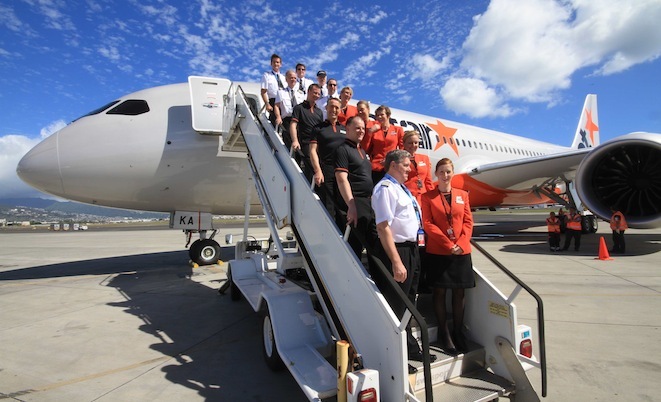 What is Jetstar’s official livery? I thought the body of the aircraft were silver, but this one looks cream or off white?! Is there a flight number to track it on FlightRadar24? There was quite a crowd out at Melbourne Airport this afternoon. Here are some shots I took of the new bird.